Here is a list of just some of the gutter services we provide in Hamilton, OH. When your rain gutter system is not performing at its peak, there could be a variety of reasons why. A quick visual inspection could reveal the problem instantly, but not all issues are this easy to pinpoint. If you're unsure of the cause of the problem, it may be time to call for a professional inspection and assessment of your guttering system. Overflowing rain gutters can signal an issue with debris creating clogs or possible a problem the downspout portion of the system. The down spout is where draining from roof runoff is drained away from the building. When it becomes clogged or damaged in some other way, the water cannot flow and may pool in other places, causing runoff that can lead to soil erosion or worse yet, moisture damage to the materials that lie beneath the gutters. It may be difficult to assess down spout damage if you're not familiar with guttering systems. Our professional staff can perform an on the spot assessment to identify the problem quickly. Typical issues with down spouts include damaged seams, pulling away from walls and clogs from debris. We offer cleaning and repair services for a speedy remedy for down spout issues. We may also install an automatic recoiling downspout extension if the drainage is too close to the building. When the fascia becomes damaged, it will either need repair or replacement in order to hold the guttering system in place. Unless you have good carpentry skills, this task can be difficult to complete and it requires the proper tools, equipment and expertise to be done correctly. In extreme cases, damage can extend into the soffit and rafters. There is usually no way to know the extent without removal of the gutters that cover these areas of the home or business structure. Hamilton Gutter Pros performs an assessment of the damage with recommendations for solutions. We give up front cost estimates for any repairs or replacements that are needed. Gutter cleaning services may be required when you don't have the time or physical ability to reach difficult or high areas of the guttering system. It is particularly useful when clogs form in the down spout sections as they can be difficult to clean unless you have the right equipment. Hamilton Gutter Pros have the skills and know how to quickly and efficiently clean all areas of the gutter system. 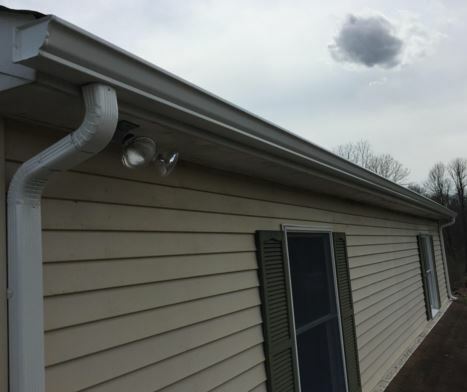 When it comes to the installation of new or replacement rain gutters, it's important to ensure that the job is done correctly. Hamilton Gutter Pros specialize in the installation of a variety of different gutter types and styles. They also offer customization of these systems to ensure that drainage is placed in the most appropriate areas to avoid washout and erosion. Maintenance of a gutter system can help in avoiding common problems including wear and tear or pulling away from the roof or wall. The majority of major gutter issues are avoidable if they are caught in the early stages and fixed. Excessive debris control can often be alleviated with the installation of filtering screens that prevent the larger items from becoming lodges into the trough of the gutters. Gutter maintenance involves a periodic inspection, cleaning and making any minor adjustments before they become issues. In many cases, problems with the gutter system can be fixed with a few minor repairs. This is more advantageous that a total replacement. Some repairs are simple enough for the do it yourself homeowner to successfully tackle, while others may require a greater knowledge base and specialized equipment to get it right. We perform small and larger repairs to help keep your gutter system performing at its peak. When you're in need of assistance for gutter issues in the Hamilton, Ohio area, call on our team of professionals at Hamilton Gutter Pros. We're here to provide you with fast, courteous and professional assistance for the spectrum of gutter cleaning, maintenance, installation and repair services.